Tooth sensitivity and dental pain can be excruciating. It can derail your life and cause severe emotional and physical stress. Gentle Family Dentists treats patients throughout West Liberty and Muscatine IA and offers comfortable treatments and even relaxation dentistry. Today we want to talk about the causes of dental pain and why your mouth might hurt. No one tooth is the same, and everyone’s mouth is different. Everyone has different pain levels, but we want to show three common reasons for dental pain. Ideally, you should visit the dentist once every six months and NOT wait until you’re in pain. Of course, Gentle Family Dentists will help you with any treatment you may need, especially if you have a dental emergency. You can schedule an appointment with us by calling 563-288-2612. Tooth decay is extremely common. In fact, about 92 percent of people have tooth decay. It’s rare to find someone who doesn’t have tooth decay, including most dentists! Tooth decay first attacks the enamel of the tooth, which is the outer layer. The enamel is the hardest substance in the human body, but it can succumb to tooth decay. The bad thing about any dental disease is that it will persist and spread if left untreated. That means tooth decay can make its way from the out layer of the tooth to the root without dental intervention. The inner tooth contains the nerves and dental pulp. Infected dental pulp or infected nerves can be extremely painful! Additionally, patients can experience dental pain with small cavities. During your cleanings and exams, our dental team is trained to find the smallest signs of dental decay. Gum disease is the leading cause of tooth loss in adult. It can strike with little to no warning and be extremely painful. In its early stages, gum disease often causes bleeding or swollen gums. In its later stages, gum disease can cause the teeth and gums to pull apart. Any stage of gum disease can be painful, and it’s important not to ignore the signs of gum disease. The bad news about gum disease is that it’s incurable in its later stages. Our office using antibiotics and even soft-tissue lasers to treat gum disease. The laser evaporates the disease and makes it easy for the teeth and gums to naturally reattach. We’re using the laser as an alternative to traditional gum surgery, which uses scalpels and stitches and leads to a lengthy recovery. Many patients wake up in the morning with constant headaches, jaw pains, or even tooth pain. The reason is often traced back to the temporomandibular joint (the TMJ), the hinge joint that is at work each time you open your mouth. 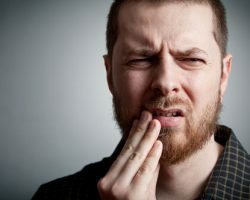 If a patient has dysfunction in the jaw joint, they can sometimes have bite issues or even clench or grind their teeth. Clenching and grinding is an involuntary habit that can lead to serious problems like gum recession or even tooth fractures. Our office is using a special splint to help patients with TMJ issues. The splint is designed custom to your smile and prevents you from clenching or grinding at night, relieving pressure from the jaw. Our patients who use the TMJ splint notice an almost immediate improvement. These are just a few common reasons your mouth might hurt. Remember, dental pain isn’t normal. If you’re in pain, something is wrong. Let us help you resolve the issue. Give Gentle Family Dentists a call today at 563-288-2612 to book an appointment.